Brighten her day in more than one way! 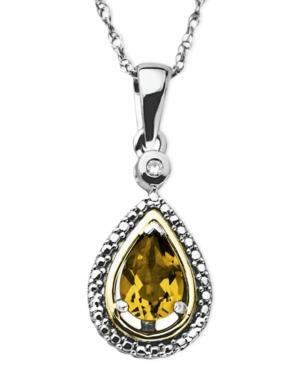 This stunning pear-cut citrine pendant (5/8 ct. t.w.) not only makes a special November birthday present, but it lights up any look with its rich, yellow hue. Set in 14k gold and sterling silver with a sparkling diamond accent. Approximate length: 18 inches. Approximate drop: 1 inch.